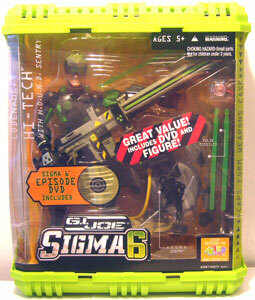 Description Of Item: Contains one free Episode of Sigma 6 on DVD.Blast into high-octane action with this awesome member of the SIGMA 6 team ? DUKE is ready and willing to take COBRA head on! Snap on the attachments for his unstoppable SWITCHFIRE multi-mode blaster to load up for action, or take to the high ground by activating the working grapping hook with rapid-climb feature!